Click the button below to add the Bosch 18-Volt Lithium-Ion 2-Tool Combo Kit with Impactor and Hammer Drill/Driver to your wish list. Bosch Litheon combo kits offer versatility for multi-tasking. 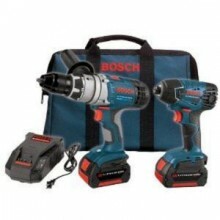 Drill Driver features High torque mode produces over 650 in.-lbs. High speed mode produces 1,800 RPM. Durashield Housing & unibody powertrain provide optimum reinforcement to withstand real world conditions. Bosch Litheon Batteries - State-of-art Lithium-ion battery technology coupled with Bosch's proprietary ECP (Electronic Cell Protection) system guarantees the optimal performance of tool and batteries even for tough work conditions. High torque mode produces over 650 in. lbs.